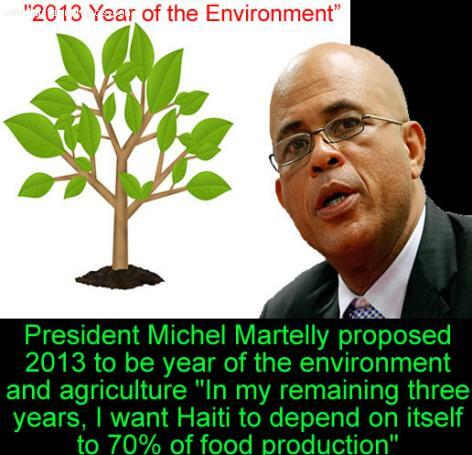 In 2013, President Michel Martelly proposed at the Independence Day celebrations that 2013 is to be dedicated as the year of environment and agriculture. The Haitian president made the promise that he wants Haiti to depend on itself for at least 70 percent of the food consumed in the country. He insisted that the environment will be one of his top priorities for the remaining years in office. The president wants each and every Haitian Haitian to plant at least one tree as civic contribution to a better resistance to natural disasters. To commemorate the 209th anniversary of Haiti's independence in his official speech in Gonaives, the Haitian President said that the founding fathers signed the national independence, he is calling on Haitians to come together to rehabilitate the country's environment.